Make sure that the air conditioning systems you have at home or at your office are working in top condition. Not all HVAC problems can be diagnosed at first glance, so it’s best to partner with an established HVAC company to guarantee a cost-effective air conditioner repair. Whether you have clogged AC filters, broken thermostats, or dirty drain lines, a seasoned team of HVAC contractors can surely get the job done correctly the first time. With many Virginia Beach HVAC contractors to choose from, it is important to be critical about hiring the right air conditioning company. Listed below are some tips on how to choose the best HVAC company. They Have Received Positive Reviews From Previous Clients. When you’re trying to come up with a list of possible air conditioning contractors, it is helpful to ask for recommendations from family and friends. Aside from their personal experiences, you can also take a look at online review websites as well as check out the testimonials page of several company websites. Prior research about HVAC companies can go a long way. You can reach out to previous clients and try to learn more about the quality of the HVAC repair services they have received, the professionalism of the technicians, and the efficiency of their service. Be mindful of complaints, one-star ratings, and other negative feedback. Rigorous home/workspace evaluations and inspections are required so you will know the root cause of your HVAC dilemmas, allowing you to create and design long-term solutions for them. The square footage of your home or office, the number of windows in the room, and the type of equipment you have are just some of the factors that have to be considered for the HVAC repair services that you might need. Be cautious about HVAC contractors who settle for giving you an estimate over the phone. Even if their representative asks you detailed questions about your situation and your air conditioning system, there are many issues that cannot be identified with just a phone call. It is still vital for their technicians to see the site and your equipment in person. They Have Top-Notch Repair Equipment. Technicians who are equipped with the proper gear and supplies can deliver great results. 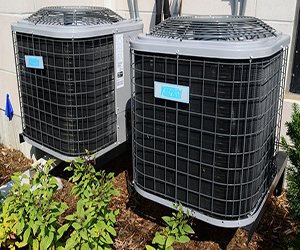 The right equipment, paired with exceptional workmanship and extensive skills, will certainly lead to a long-lasting air conditioner repair solution. While you’re in the process of choosing a Virginia Beach heating service provider, you should inquire about the kind of tools and products that they use for their projects. To receive unparalleled air conditioner repair, trust only specialists who have extensive experience in the field. Find HVAC contractors that are staffed with experts who are capable of delivering outstanding results during your specified timeline without going over your budget. Aside from the quality of their HVAC repair services, it is necessary to look for Virginia Beach HVAC contractors that are easy to work with. Since an entire repair process can take several hours to a few days, it is essential to hire technicians who try to make the project a whole lot easier for you and your family. They Offer Financing for HVAC Systems. Buying new AC equipment or having your system repaired can be expensive. That is why you should turn to HVAC companies that offer financing options that allow you to pay for their services and products over time. Several HVAC contractors provide great deals and financing assistance at low interest rates, so make sure to ask about them during your preliminary consultation. They Provide Good Value for Your Money. Getting the cheapest quote might not mean you’ll receive the most cost-effective option. Be wary of quotations that are too good to be true because those low rates may not lead to the results that you’re looking for. These low bidders may give you band-aid solutions that could lead to worse air conditioning problems. Searching for the root cause of HVAC dilemmas and creating a durable repair solution may not be affordable. But high-quality HVAC installation, repair, and maintenance are always worth the extra money in the long run. They Built a Remarkable Reputation in the Industry. When it comes to the quality of the air that you breathe inside your home, you should rely only on established Virginia Beach HVAC contractors. An HVAC service provider that has been in business for more than a decade could possibly still be operating because it is trusted by many clients. Smiley’s Heating & Cooling is one of the leading HVAC contractors in Virginia Beach. For over 33 years, our seasoned professionals have been providing nothing but the best air conditioner repair to residents in our community and the surrounding areas. Our team goes to great lengths to ensure that we give you HVAC maintenance and installation services that are tailored to your specific needs and preferences. Read on to discover more reasons why you should partner with our air conditioning company. Your Problems Will Be Handled by Dependable Technicians. Our HVAC company is staffed with a team of reliable professionals that goes the extra mile to provide you with unparalleled services. We make certain that we only employ knowledgeable specialists. More and more residents are hiring our experts because of their professionalism and impeccable work ethic. You Can Count on Us for a Wide Range of Installation and Repair Services. From heating and air conditioning repairs to duct work, new system installation, and air quality maintenance, our HVAC company has you covered. Our team is equipped with the skills and knowledge needed to provide all the HVAC-related services that you require. Learn more about air conditioning here. In addition to our experienced technicians, we have fully stocked service vehicles and top-notch equipment. We are dedicated to providing you with results that exceed your expectations. We Are Becoming a Respected Name in the HVAC Industry. Since 1986, our HVAC company has been the number one provider of premium heating, ventilation, and air conditioning installation, repair, and maintenance services. As a locally owned business, we are passionate about being of service to every family and entrepreneur in our community and the surrounding locations. Our exceptional services, competitive rates, and hassle-free transactions are just some of the reasons why we gain the loyalty of our clients. Get in Touch With Our Reputable Team Today! At Smiley’s Heating & Cooling, we are more than happy to provide the professional HVAC assistance that you need. We cater to homeowners and businesses in Norfolk, Virginia Beach, Chesapeake, Portsmouth, Suffolk, Newport News, Hampton, Isle of Wight, and Smithfield. If you wish to learn more about our company and the work we do, don’t hesitate to reach out to our team. One of our friendly staff members will get back to you as soon as possible. Better yet, schedule an appointment or a free service estimate to speak directly with one of our approachable technicians. Click here to learn more about us.